Suitable for use in hunting rifles and vintage military rifles, these .30-06 rounds burn cleanly and deliver good long-range accuracy. 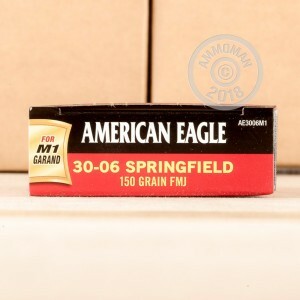 Manufactured by Federal Premium Ammunition, they use a 150 grain full metal jacket bullet, non-corrosive Boxer primers, and reloadable brass cases. 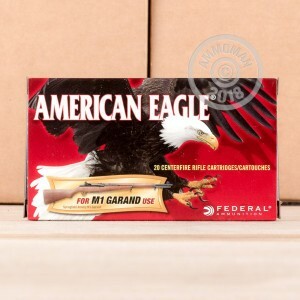 This case of 200 cartridges contains 10 boxes of 20 rounds each is a great way to stock up and save. Best known for its use by the US military in every war from World War I to the Vietnam War, the .30-06 has served in a wide variety of small arms ranging from the M1903 Springfield and the M1 Garand to the Browning Automatic Rifle and the M1919 "thirty cal" machine gun. 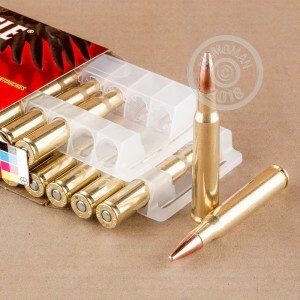 Replaced in military use by the similar (though shorter) 7.62x51 NATO for a variety of logistical and political reasons, it remains a highly popular sporting round today. Buy $99 or more in one order from AmmoMan.com to receive free shipping! Pay only the list price, and not a cent more.